"Proverbs are true / but not quite / true enough." Josephine Singer writes in "The Surprises." This is not a proverb but the beginning of a poem. All of the poems in this book seek to say what is true enough, what is truer even than proverbs are. Singer's proverbial insight, like Kafka's, describes the reality behind things, in a spare and stark place that is not for us. Reality, like a poem, is a corridor between dark and dark, that leads at last to a "true recess," emptiness and void, "not a soul in sight." But still in the darkness there are circles of lamplight, places of rest. "What but a desire to stay here would have made me come to this desolate place?" asks Kafka. 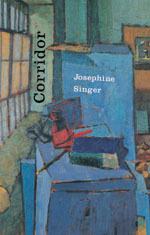 We too want to stay for a while, learn for a while, in the desolate places Singer shows us and of which she somehow manages to make a sojourn—a true enough home, even in the corridor. Josephine Singer's poems have appeared in The Southwest Review and in the Library of America volume of American Religious Poetry.